Universities have lost public support in recent years. In order to get it back, college presidents should worry less about how their institutions fare in college rankings and focus more on affordability, great teaching and doing research that matters most to the communities they serve. The book comes at a time when an increasing number of Americans – mostly Republicans – have lost confidence in higher education. For instance, a 2017 Gallup survey found that while 56 percent of Democrats and Democratic-leaning individuals had a great deal or a lot of confidence in higher education, only 33 percent of Republican or Republican-leaning individuals did. 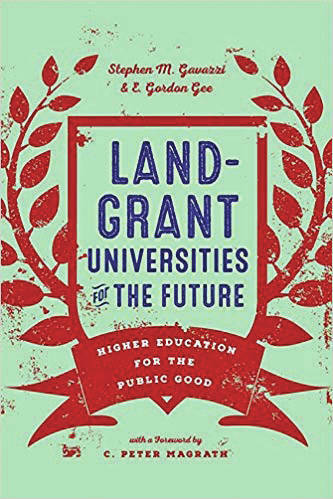 For the “Land-Grant Universities for the Future” book, my co-author – West Virginia University president (and former Ohio State University president) E. Gordon Gee – and I interviewed 27 presidents and chancellors about the current issues facing public universities. Several themes arose. We then ran those themes past people who work outside of a university but who still have an interest in higher education, such as lawmakers, college accreditors and community leaders. Unlike the university presidents, many of whom noted the pressure they were under to maintain or increase their stature in U.S. News and World Report and other lists, stakeholders weren’t concerned with how well a university did in college rankings. Instead, they were concerned with how well the institution was serving the public. Here’s a portion of what they recommended. Before university leaders ask for more state support, they must demonstrate that they are being more efficient with the funding they currently get. Those universities leading the way on this front – including exemplars such as the University of Wisconsin system and The Ohio State University – are directly connecting savings gained from lower operational costs with noticeable reductions in the cost of attending college. In fact, Ohio and Wisconsin were ranked No. 1 and No. 9, respectively, in lowest tuition increases over the last decade. There also should be much greater emphasis placed on high-quality instruction of both undergraduate and graduate students. More and more universities seem to be getting this message, as recent teaching “centers of excellence” have sprung up in such geographically diverse institutions as Boston College, the University of South Carolina and the University of Oklahoma. These centers all promote a similar message that great teaching really matters at the university level. While rock-solid evidence of what constitutes effective teaching is still lacking, most of these efforts are built on the commonsense notion that instructor self-awareness goes a long way toward increased teacher effectiveness. Colleges shouldn’t be isolated places where learning takes place only with students on campus. Instead, colleges must do more to engage the communities in which they are based. That’s what San Jose State University is doing through its award-winning CommUniverCity initiative. Through the initiative, the university partners with the city, local businesses, nonprofits and residents on a variety of projects. The projects range from “tactical urbanism” projects to liven up small parts of the city to a nutrition and garden education program meant to teach children to live healthier lives. CommUniverCity is part of a trend of increased interest in community engagement, as evidenced in the growing number of colleges that successfully apply for the Carnegie Foundation’s Classification for Community Engagement and the Innovation and Economic Prosperity designation awarded by the Association for Public and Land-Grant Universities. Using the Innovation and Economic Prosperity designation as an example, there were only 16 universities with that designation in 2013. As of this year, 63 universities have been given that designation. When research is conducted, it should be easy for the public to recognize the immediate benefits. Perhaps most well-known are the results generated from the research conducted at university medical centers, such as the latest breakthrough on spotting early stage cancer through a blood test developed at Johns Hopkins University. Beyond medicine, universities also must be involved in the most pressing social ills. For example, researchers from a variety of disciplines at West Virginia University – from behavioral medicine and psychology to economics – are collaborating to battle the opiate crisis that is raging in that state. National rankings are meaningless, especially if a college degree is not both affordable for and accessible to qualified students. But while colleges are under pressure to stay or become affordable, they also face increased demand for amenities such as upscale dorms and state-of-the-art recreational facilities. This means tough choices must be made. Many universities are now erring on the side of cost containment. The University of California system’s new affordable student housing initiative provides perhaps one of the best and most recent examples in this regard. The initiative involves 14,000 new affordable student housing beds by fall of 2020. Of course, difficult decisions demand leadership. Which brings us back to the university presidents and chancellors we interviewed for our study. Importantly, when asked to describe future threats to public universities, many of these leaders mentioned the dangers associated with complacency. Is that future already here? Are universities now the victims of their own previous successes? Evidence from opinion polls such as the Gallup survey and the Pew Research Trust survey indicates the clear and present danger that complacency poses to the nation’s support for its public universities. Presidents and chancellors who ignore the public’s demands for change at their universities – to become more efficient, value great teaching, conduct research that solves real-life problems, be more affordable and accessible to the widest range of students – do so at their own peril. Stephen M Gavazzi is Professor, Human Development and Family Science, The Ohio State University. He does not work for, consult, own shares in or receive funding from any company or organization that would benefit from this article, and has disclosed no relevant affiliations beyond their academic appointment. The Ohio State University provides funding as a founding partner of The Conversation US.